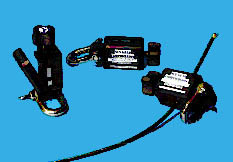 This NEW and unique SEA-GEAR innovation allows attachment of multiple nets or other on-line instrumentation at selected cable intervals. Precision machined from delrin and stainless steel materials the lightweight “BOOK” CLAMP features superior strength, durability and ease of operation. Counter-clockwise rotation of the locking knob opens the door and self-centering cable jaws to accept cable diameters ranging in size from .31cm (1/8”) up to .79 cm (5/16”), clockwise rotation of the knob simultaneously closes and locks the door while grasping/securing the cable. Based on the hydro-wire selected the book clamp is available with either delrin, 1500-BCD or stainless steel, 1500-BCS jaws. No tools required.